I am not happy. It is downright cold here. I don;t enjoy having to put a coat on in October. It is not supposed to be that warm this afternoon either. And I need to add that my boys are not happy either. When I woke up this morning Henry was under the covers with only his little head and front paws out. He was so cute. I have been watching the news and the voting insanity for my out of state friends (and Laur) continues to be nuts. My boss waited 4 and a half hours to vote yesterday afternoon. So far over a million people have voted early in Ga. Maybe those waiting for actual election day won't have a problem and will sail in and out. I am totally disgusted with the elected officials campaigning. Last evening the TV bombarded with negative adds for both Saxby and Martin. And the adds were one after another, after another ad nauseum. Come on Nov 4th! Meanwhile the cleaning did not get completed on the weekend and I sat with my nose in a book last night. I did get Kris's bag cut out finally! Had dinner last evening with Laur and she is on her way back to Japan this morning. She is supposed to come home Nov 15th. I am going to spend the rest of today working on straigthening up and putting away stuff. I am almost finished with the kitchen. The next task is the guest bedroom. But first I have to thaw out!!! I am off today and I thought-good it is raining so I will go vote. Got the body up and out of the house and headed out for the voting place. I could not believe the line. I was not dressed nearly warm enough and it IS raining. Went to get a haircut-needed it for about 6 weeks! Then went back...line is now at least twice as long. 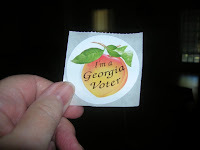 Since I am also off on Monday, I will try again then...since starting Monday there are more polling places open. Laurie di get to vote today but she is in Fulton-only had to wait an hour and a half. While I am glad to see that people are interested in the election this year, I also wonder why???? 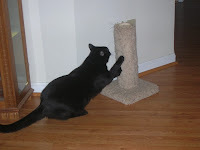 And in Laurie's final words on her blog today...."go Obama" and I say ditto!! Haven't done any sewing this week as the library book that I had been waiting for came in. It is another Emilie Richards Shenandoah Valley novel. Laurie loves teen angst-I seem to be on older women angst! But since there is nothing on TV that I want to watch, this is a good time to read. 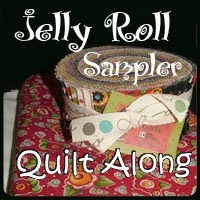 I did finish the rows of the latest jelly roll quilt I have been working on and need only to sew on the borders. I'll post a pix when I get around to doing that! 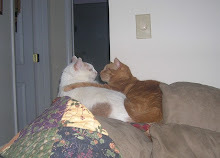 Henry and Spiff relaxing after a hard day's work! Spooky fianlly emerged from the closet after the floor guys left-although it was not for a couple of hours. He is very discrete! The boys are not too sure about the missing carpeting! So I checked Gretchen's blog this AM-Stella Bella and then went on to check out Michelle's birthday blog. Such fun checking on what others are doing! Laurie and I had dinner last evening. She is doing a little bit better. Although her house is certainly quieter now (and she hates it). She has another trip to Japan in the next few weeks but when she comes back, I'll go with her when she looks for a new roommate. Yesterday I decided to make a call to Empire and find out about flooring. Did not expect to get an appointment on the same day! Yesterday afternoon I met with rheir rep and discussed replacing the disgusting carpeting in my living room and bedroom. Ahhhhh it is happening on Friday! Also not quite what I expected! But the carpeting is the original in the house and is very sad. It is probably builder's grade to begin with-so come Friday I will have laminate flooring in the 2 rooms. I am going to be very busy in the next couple of days moving stuff- clutter around so they can proceed with the project. Yikes I have so much "stuff" to move! Since gas is once more plentiful here, I decided that I needed to check out the quilt shop that Peggy Barkle told me about a few weeks ago down in McDonough. (Had to look at a map to see just where McD was). I bought the pattern Kris and I have been waiting for for the Amy Butler bag that she wants and 2 other patterns. Then I decided I would check out the sale in Jackson. I lost another road on Mapquest but got to Jackson anyway. Nothing tempted me at that shop so I was in and out in about 15 minutes. On the way home I detoured off I75 again and decided to come up on smaller roads-it was a pretty although cloudy day-looked like a real Fall day. So I am on GA20 going north because I know I can cut up to Snellville that way. Funny thing happened the car (on it's own) turned toward Sweet Home. I wonder if the Evil Temptress has tampered with my automobile??? So I am in Conyers, I guess I might as well check in on Melisa and her gang...I did help the economy there and got some fabric for latice and a border for a pattern I bought earlier in the day. And as I told Melisa, when I got home I took a nap. It is hard work doing all that planning! 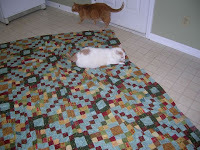 So the quilt camp quilt is finished and Spiff and Henry are checking it out. Actually, I think Henry is probably looking for any morsel to eat. Foolish boy-there is nothing to eat in that kitchen!! Next shot is leftovers. 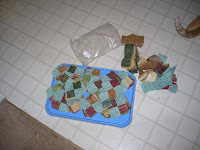 I had so may strips left over that I took them apart and made 4 patches out of them-there is over 100 on the tray and a pile of cut up fabric. Not a clue as to what I will do with that stuff! Next shot is my pile of binding. I haven't quite figured it out as you can see and ALWAYS have left over binding. 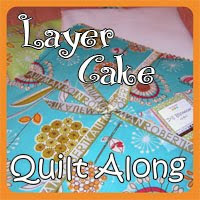 I am afraid I will get three and a half sides of a quilt done and run out-thus I make lots. But what does one do with all this leftover binding? Today is a sad day...Laurie's beloved Bailey fought the good fight but just could not fight anymore. 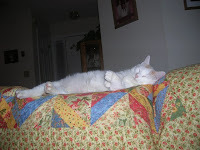 Back in March the vet told Laurie that Bailey had early renal failure and had 6 months to 2 years. It is just past 6 months and the last few weeks have been really hard. Bailey waited for Laurie to return from Japan and China but this past week she had been really suffering. And so the decision was made. It was not an easy one as all of us who are pet lovers know. She was a good dog and we shall all miss her. Well there are other reasons but Henry really does like to snooze on a new quilt. He really prefers the new ones, although he will sleep on any in a pinch. 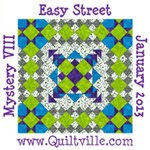 I finished the retreat quilt yesterday-all eight million of those little 2 inch squares. I had a lot of strips left, so I decided to make four patches out of them. 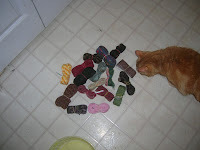 I am thinking of either putting some of them on the quilt back or maybe making a small quilt as a companion quilt. Another glorious day in the Atl. And I have a full tank of gas-life is good! Laur is home from China with a cold. This morning when I opened up to get to the web site, one of the teasers was "19 Hot spots for Autumn" and there jumping out at me was a picture of the Bear MT Bridge and looking south down the river toward Peekskill. I could see the "goat path" and Anthony's Nose. Oh how I love the Hudson River Valley...well maybe just to look at because I don't want to deal with the snow up there anymore. Anyway, this morning I needed to put a sweater on because it was right chilly! I know that by noon and definately by the time I get ready to go home, I will not need it. Yesterday afternoon was take your breath way special-the sky was clear, a slight breeze and glorious warm, not hot temperature. The boys enjoyed nature out the back door! This is probably the best time of year, weatherwise....no AC and no heat. I won't turn on the heat until Dec. 1st if I can help it!! AND I think that the gas situation is showing a definate improvemnent-although there are still a lot of stations with no gas...I think by the weekend it should be almost "normal"
According to the news this morning, our gas problem should be over very soon. I sure hope so...I have been being very careful about how much driving I have been doing. I still have a little more than half a tank so I should be okay. Worked some more on the retreat quilt, Union Sq. I am sewing rows together. I should be ready to do the next step by the weekend. Couldn't stay awake last evening and therefore this morning I was awake verrry early (but I didn't get out of bed)-just hung out with Henry. Spooky was not a happy camper-he kept meowing at me to get up and feed him! Boy am I leading a boring life this week!